“There is a wealth of experience out there that can be supportive of students and other alumni in the network,” says Holifield, explaining that SBAN plans to support black alumni and students and encourage intergenerational connections. Through informal email conversations, discussion on a Swarthmore Black Alumni Association LinkedIn group, and biweekly conference calls, a key group of volunteers, the SBAN Organizing Committee, emerged. Working closely with alumni relations staff this summer, Sherry Bellamy ’74, Harold Buchanan ’69, Kip Davis ’75, Russell Frisby ’72, and Holifield collected ideas about how black alumni would like to reconnect with fellow alumni, students, and the College. The inaugural event brought 75 alumni, students, parents, faculty, and staff together for panel presentations, a reception at Courtney Smith House, and lively discussion of what SBAN should become. The event also attracted student voices. “As a black student at Swarthmore you hear about alumni opportunities, like internships and externships, but you don’t usually see alumni who look like you,” said Taylor Clark ’16. Having the opportunity to meet black alumni of all ages, and get a multigenerational perspective on life during and after Swarthmore, drew Clark to SBAN and motivated her to attend. In future gatherings, Paul Cato ’14 hopes to see more of the straightforward and honest discussion of black students’ needs and welcome alumni back to campus informally to speak with the Swarthmore African-American Student Society or visit the Black Cultural Center (BCC). Multigenerational mentorship benefits not only the mentor and mentee but the community of black students and alumni as a whole, remarked Jaky Joseph ’06. Expanding the Rubin Scholars, a mentoring program that matches students from disadvantaged backgrounds with a staff or faculty mentor and provides internship opportunities with alumni, is one possible fundraising initiative for the organization. 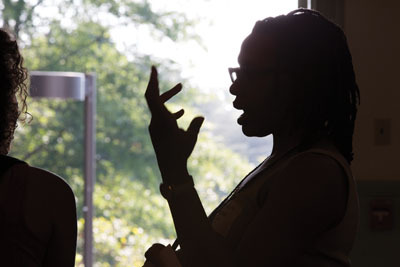 For more information about the Swarthmore Black Alumni Network, or to get involved, contact Alumni Relations at 610-328-8402 or alumni@swathmore.edu.